This is a neat little trick that takes just a minute but reaps amazing benefits (ok, not really). It’s how to change the text “AM” or “PM” by your clock to read whatever you want (as long as it’s less than 12 characters). Like the screenshot below. Oh, and the article is written for XP, but it works in Vista too, as you might have guessed from the screenshot. I have spent too much time installing SnagIt onto users’ PCs because they want to be able to do a partial window capture in XP. 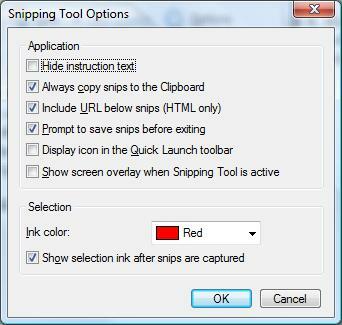 Here’s a move in the right direction by MS – a built-in snipping tool bundled with Vista. Now, it should be known that I see Vista as an opportunity to learn rather than as a panacea for our tech ailments. I am committed to finding the benefits of new technology. Plus, many of us are in the “I bought this and I’d better learn how to use it” boat. So this one’s for you (and me). Click the drop-down arrow on the “new” button to choose a new snip shape. o This option saves the item to your clipboard for easy pasting into emails, documents, etc. Just like the older PrtScn functions. o This is for pasting info from Web pages. This helps you avoid plagiarism and helps your readers access your sources. o Gives you the option to save as a file for future use or for editing. o This gives you a grayish overlay over the screen to let you know that you are in “snipping mode” (that’s not a technical term). It’s just a friendly reminder that you are about to take a screen shot. o This is the border-like box around the area you just snipped. You can choose the color. o I don’t like this, and if I make more use of this tool, I will likely turn it off. It leaves the red (or whatever other color you chose) border on the picture and inserts it along with the picture into whatever document you use the snip for. If you like this, great. If not, well, now you know how to turn it off. I do have a few things I dislike about this tool. 1. I haven’t figured out a way to do menu screenshots with cursor (I did figure out how to do a screenshot of a menu; it could be a little confusing, so if you need to know, comment and I’ll add it), and it doesn’t do video screenshots. 2. It doesn’t have a delay (timer) so you can get ready after clicking OK.
It’s not nearly as robust as SnagIt (I use SnagIt at the office). But SnagIt is not free. And this tool doesn’t hog any additional system resources, which to me is a major plus (SnagIt runs a background process). It doesn’t minimize to your system tray like so many annoying programs do.